Our family owns this house from generations, and we love to share it with people from all over the world, coming for family and friends reunions. Our guests really appreciate the incredible atmosphere that this place naturally offers. Two Full Kitchens, Peaceful and silent Countryside view, Bicycles, Fresh products from our vegetable garden (according with the season), IPod speakers. We, all 15 of us from Germany and US, had a great time at Il Berneto. The house and its grounds are wonderful to rest and relax. The views, the pool, the fireplace, the short walk to shops and cafe, the beautiful village and the great welcome from everyone were memorable. Actually, it was out of a dream. Il Berneto is a great place to bring the family together. Our 13 year old son said that Il Berneto was the best part of his European vacation. Il Berneto is lovely. The house is beautiful with lots of old world charm. From both the house and the pool there is a great view of the local town. We were a group of 14 and had plenty of space. We made great use of the pool, ping pong table and washing machine. The wine opener also got plenty of use! We made trips to several great wineries in Montepulciano. We also enjoyed visiting Orvieto, Civita di Bagnoregio and the hot springs at Terme di Saturnia. Having a cafe and store at the end of the driveway was very convenient. Everyone could wake up on their own schedule and walk down for coffee or breakfast - making the mornings very relaxing. We also enjoyed being able to walk to Cafe Seven for great food and hospitality. One night we ordered food from restaurant L’Ape Regina and Martina arranged for Anna to come help serve dinner and clean up - such a treat. Martina also helped arrange transportation to Siena for the Palio festivities. We loved our time at Il Berneto. Our only regret is that we didn’t stay longer. Thank you Martina for sharing your beautiful home and being a charming hostess. We visited the property to celebrate a special birthday occasion in late September. 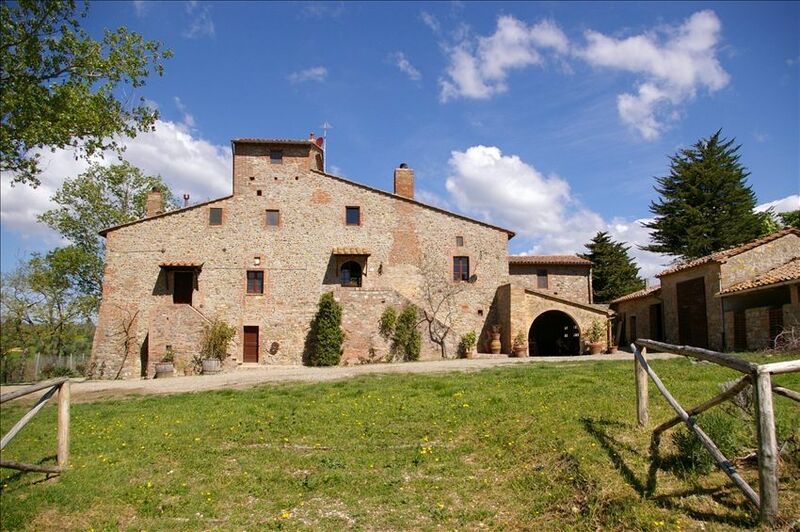 Easily located within an approx 2 to 3 hour drive from major airports the property was easily in reach to people flying in from different places to Rome, Pisa, Bologna and Florence. This is a special property. Outstanding location, spacious, well kept and cared for by caretakers Angelino and Anna (including use of a vege patch!). Any issues that arose were dealt with quickly. A+ communication. We would love to return. Thank you for sharing your piece of paradise. Just finished a week at IL Berneto with family & friends (9 total) and the Villa was actually more beautiful than the pictures if you can imagine. Martina was wonderful as was Angelo and Anna who cooked for us one night. The location is great for visiting Tuscany and Umbria with easy day trips (all within an hour except Florence) to Sienna, Assisi, Montepulciano, Florence and Orvieto. There is a pastry/gelato shop & a small market at the end of the beautiful entrance to the Villa that you can walk to for any food or wine you need. Café Seven had great food and you can arrange a local winery tour/tasting with the owner whose cousin Seffano runs the winery a few miles from the Villa. The weather was wonderful and we were lucky to have the pool open a few days before it was closed for the season as a gift from Martina. I can't wait to go back and would recommend this property for anyone and again thank you Martina for a great week. Il Berneto is magical -- our group of 18 (8 adults and 10 kids) just completed our week stay, and we wish we were staying longer. As with many of the other reviews, our only negative is that we have to leave. We absolutely LOVED everything about our stay at IL Berneto - the villa itself is amazingly well done, the property, pool and view outstanding and we also loved our little adopted town of Monteleone D' Orvieto. Martina and Carlotta were great to work with and Angelino and Anna very helpful and Anna cooked us a fantastic meal one night. The combination of the country/quiet setting of Il Berneto with being able to also walk right into the town and to Gelato/Dinner right at the end of the long driveway was perfect for our group. We have travelled many times both in the US and abroad and we have all agreed that this was our favorite villa and overall vacation experience ever. Also, easy travel to many great hill towns, etc. Highlight for the kids (and grown-ups) were Asissi, Civita di Bagnaregio. Thank you for sharing your wonderful home. We would love to come back some day!! This is what is must be like to summer at an old family place at the top of a Tuscan hill town. The views were spectacular from all sides of property. The place is even more beautiful that in the pictures. Angelo and Martina were wonderful hosts. Don't miss using the pizza oven -worth the euros to have Angelo spend 3-4 hours firing it up (a hot and messy job!). We found pizza dough at the larger grocery store near the train station - it's sold in long rolls in the refrigerated section, not the dough balls I was expecting. We had absolutely everything we needed either at the villa or within walking distance - including the oft-mentioned gelateria at the end of the drive. Cappuccino bar is just a little further up the main road on the left. Another don't-miss is the walk through town to the 180 degree overlook. There's not much in town itself (no touristy shopping for example) but it's unbelievably picturesque. This property is so charming and truly ancient in some parts. However, the inherent unevenness of steps/flooring and frequent level changes in the house made it a little treacherous for those with mobility issues, especially in the middle of the night. Not a criticism, just a note for those who might need to worry about that. The beds are hard. There's no way around it. I should be used to the Italian standard mattress by now but....ouch. No way to avoid a car rental. The drive down the hill to either the A1 or the train station is about 15 minutes and not walkable. We found that there was more variety and frequency of trains if we drove to Orvieto train station - about 20 minutes away. Orvieto should be a required stop regardless for anyone visiting this part of Italy. One of the most spectacular towns in Europe. The rental rate is for the whole of the houses, no matter of the number of persons staying: each house may not be used by more persons than the maximum number indicated. No parties on the premises or external caterers unless by special arrangement with the management. No pets inside. No smoking inside.